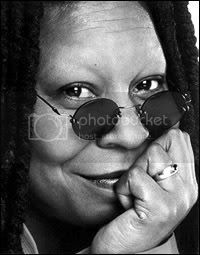 Well, it was announced yesterday that Whoopi Goldberg, one of my favorite celebrity women, will be the new co-host/moderator of The View. She's so smart and talented, and it's going to be so wonderful to have such a down-to-earth person on that show. Someone who doesn't bend over backward to maintain a super "feminine" image. I happened to catch the show yesterday for the announcement, and I was delighted to see her come out in comfortable-looking clothes, cute sneakers, and very little makeup. Not that there's anything necessarily wrong with with the other hosts' dresses and suits and heels and big hair and makeup, but that's certainly not how all women live their lives every day. I think she will be a totally refreshing addition to the show. It may not be as doomed as I thought it was. Now we just cross our fingers for them to hire Sherri Shepard when they announce the next new co-host in the fall. 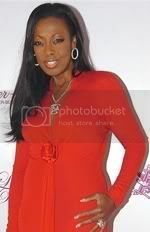 In related View news, it's making headlines that former View co-host Star Jones Reynolds is now being up front about the fact that her dramatic weight loss was a result of gastric bypass surgery. Reynolds, 45, says she was "intentionally evasive" when people asked how she'd dropped 160 pounds in three years. The former "View" co-host opens up about her weight loss and self-esteem issues in a story featured in the September issue of Glamour magazine, on newsstands Aug. 7. "Everything about me was already so public (mostly my own doing — talk about dumb! ), so of course everyone wanted to know what I had done," she writes. "I was also terrified someone would have a tragic result after emulating me without making an informed decision with her doctor." "But the complete truth is, I was scared of what people might think of me," she continues. "I was afraid to be vulnerable, and ashamed at not being able to get myself under control without this procedure." Hear that fat-shamers? She felt like she had to "get [her]self under control" (not just her weight, but herself), and she was ashamed that she couldn't seem to do it without surgery. Is this really how you want people to feel? I hope you're happy. Yeah. I genuinely think that the fat-shamers are probably thrilled. i used to think star was so beautiful, it's a shame that she felt the need to have surgery to fill society's expectations. I know, I agree. I just thought that statement, "get myself under control" was so incredibly sad. And I'm sure she truly believes that, too.